New England based Kevin Kastning is on a roll these past few years. Having released a number of collaboration albums with a range of musicians, Kevin is back with his third solo album in as many years with the 2017 CD release of A Connection Of Secrets. Like many of the classic ECM albums recorded in Europe, Kevins solo music is ripe with a unique sense of guitar exploration that he fufillls thanks to his recording with a range of peculiar looking instruments, including his 36 string Double Contraguitar. Much of the music he records is quite experimental and improvisational and on A Connection Of Secrets, Kevins use of pioneering instruments like the 36 string Double Contraguitar, the 30 string Contra Alto and the 15 string Extended Classical guitar fills in all the sonic spaces. Also of note is the inclusion on a track here of a nine foot Kawai grand piano, which shines a light on Kastnings famous, though lesser heard keyboard skills. Even though theres a corresponding line of sonic reasoning running through much of Kastnings work, on A Connection Of Secrets, his sound remains unique and inspired. When asked about the title of his new album, Kevin adds, If I give that away, then its no longer a secret! Ill say it had to do with how some of the pieces are conneted. Also speaking to mwe3.com about why he chose to also feature his piano work on A Connection Of Secrets, Kevin explains, I played a little piano on a record with Sandor Szabo that was recorded during the 2012 European Tour, called The Book Of Crossings, but it was very little and mostly in the background." 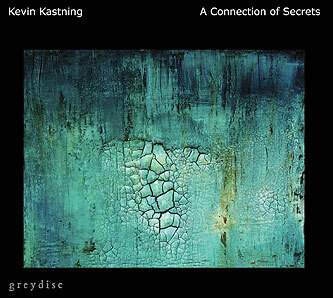 As is the case with the three Kevin Kastning solo albums and his various group-related projects on Greydisc, A Connection Of Secrets benefits from excellent album artwork and liner notes that indicates what guitars were played on what tracks. Also of note on his 2017 album is that the album also features mixing and mastering by Greydisc recording artist Sándor Szabó, done in his studio in Vác, Hungary. The latest album of groundbreaking, often startling fretboard magic by Kevin Kastning, A Connection Of Secrets is a sonic joyride from start to finish. mwe3: I had asked you earlier about why you call your new CD A Connection of Secrets and you spoke about not wanting to give away that secret! In what ways are the tracks connected and is there a way to compare A Connection Of Secrets on some levels with your last two albums Skyfields and Otherworld? Would you say that A Connection Of Secrets is more sublime sounding than your other two solo albums? Kevin Kastning: The tracks are certainly connected. On Skyfields, the entire record was one large single composition in five movements. For A Connection Of Secrets, all the compositions are connected to each other, like a narrative, or like movements in a symphony. Yet the connection is not quite the same as the compositional construction or architecture of Skyfields; the pieces on A Connection Of Secrets have their own threads and connections, but not the same motivic and thematic narratives running through and across all the pieces as did Skyfields. They tend to stand on their own a bit more. Which is one reason the titling conventions between Skyfields and A Connection Of Secrets are so different. The piano piece on A Connection Of Secrets marks a bit of a turning point as well. As for the sublimity, I'd have to leave that to each listener to decide. mwe3: The addition of your piano playing on A Connection Of Secrets makes an interesting contrast to the albums proceedings. You spoke about using the piano on your album with Sándor Szabó The Book Of Crossings. Is this the first time you play piano on your solo album? Tell us about your background with the piano and about your nine foot Kawai grand piano and how would you describe your piano technique? Kevin Kastning: I played a little piano on one or two pieces on a record with Sándor Szabó that was recorded during the 2012 European Tour called The Book of Crossings, but it was very little and mostly in the background. As I recall, most of the piano on that recording was done by depressing the sustain pedal and plucking individual strings inside the piano, so it didn't really sound like a piano. But yes, this is the first time I've used piano on a solo record, and I don't think it will be the last. My background with the piano is that I've been playing since I was a child, but I really use it for composing. I never write orchestral or chamber pieces on guitar; only on piano. I had the usual piano proficiency classes as a music major in college, but I'd say my piano technique is either limited, bad, or really wrong! It's great to be able to branch out to piano on a solo project; it's still me, but it is such an entirely different voice than my guitar-family instruments. It forces me to think differently, and I don't think anything I do on piano sounds like anything I'd do on guitar. mwe3: You were talking about unique tunings on your guitars that you feature on A Connection Of Secrets. Can you elaborate somewhat on the tunings on your guitars this time? How do you arrive with the different tunings and have you used different guitar tunings on your previous albums? 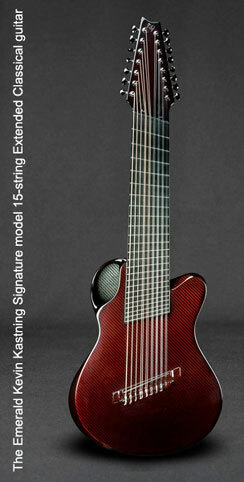 Kevin Kastning: This is the first recording wherein the 15-string has a different A tuning standard. By that I mean that most instrument tuning standards are usually A = 440 Hz, but for this record, the 15-string has an A =432 or A = 415 tuning. The other instruments on the record are all A=440. 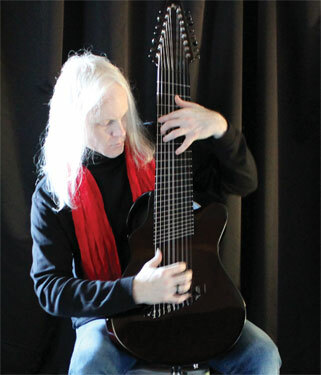 The 15-string Extended classical is mostly a double-course instrument, and those courses are all tuned to unisons. 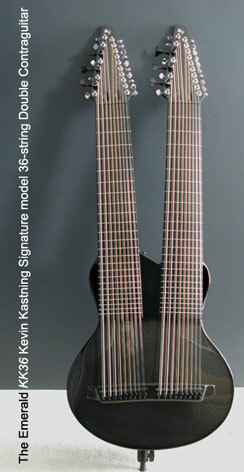 The 30-string Contra-Alto guitar has its own tunings for both the 12-string Alto side, and the 18-string Contra side. The 18-string side of the 30, and the 36-string Double Contraguitar have various tunings that I've devised, and they're selected depending on the project and the colors and textures I need for a given composition or series of compositions. If none of my existing tunings are right for a project, I'll devise new ones specifically for that project. I have been using my own tuning systems since I think around 2007; the first record on which I used my own tunings was another one with Sándor from 2008 entitled Parallel Crossings where I used a different tuning on 12-string baritone. When I'm using both the 30 and the 36 within a single album project, I spend a vast amount of time finding tunings that somehow either adhere or connect to each other, or provide a complete black-and-white contrast to each other. 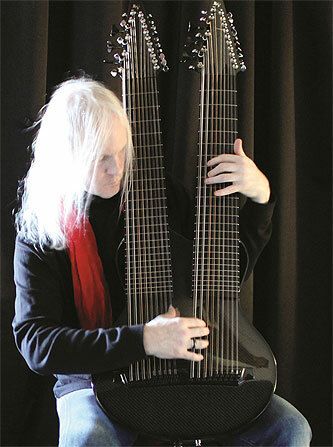 I think of the 30 and 36 as two halves of the same instrument: as if they're really a single massive 66-string instrument that happens to be separated into two physical entities. mwe3: A Connection Of Secrets was recorded a couple months ago during the winter of 2017. Do you like recording in winter the most? For Skyfields you spoke about the spirit effects while you are recording. Are you trying to connect with some other forces in nature while you record for example a blizzard or noreaster type of storm? Kevin Kastning: The only season wherein I'd prefer not to record is summer, but I think you're right; my favorite time to record is probably winter. I'm not consciously attempting to connect to the forces of winter, but I do get out into it for snowshoeing, so it has to be an artistic influence on some level. Where I live in New England, we get some pretty massive snow and blizzards, I never tire of it. I spend time watching the forests around me fill up with snow and transform into a world of black and white. Winter is ever fascinating to me. Each snowstorm is different, and each one reveals its differences and many beauties. mwe3: What can you tell us about the cover art for A Connection Of Secrets? You always choose evocative artwork for your albums, thus continuing the always relevant connection of music and art. Kevin Kastning: Yes, I always want the cover art to be connected to or representative of the music on the album. It can sometimes be a struggle to find the exact right fit. The cover for A Connection of Secrets was painted by a brilliant abstract German artist named Nino Anin. Finding the right cover art is always an arduous task, but for this record I was having a extraordinarily difficult time trying to find cover art to match the album title and the music. I am fortunate to work with some incredible artists around the world, but still yet finding the right cover art or photography for this record was starting to feel borderline impossible. As soon as I saw this painting of Nino's, I knew that was the one, and fortunately for me, Nino likes my music, so she was happy to allow her work to be used for the album cover. I think this painting has a vast amount of depth; you almost fall into it when viewing it; both dark and deep. It felt entirely right for this album, and I think visually crystallized the overall harmonic environment and compositional structures for this record. mwe3: Are you still working with Alistair Hay at Emerald Guitars in Ireland? You had spoken about a using a 50 string guitar and also a 27 string guitar at some point. How would those guitars expand on the 36 and 30 string DoubleContra guitars? Kevin Kastning: Yes, I hope to always be working on something with Alistair. At present, there is a new Extended Classical model that should be completed next month. I don't want to say too much about it until it is completed, but it will be a new guitar voice that has never before been able to exist, and certainly different than the 15-string Extended Classical. I plan on starting the recording sessions for the next solo project as soon as it arrives. Right now, we're tentatively planning for the 50-string to be our 2018 project. We've done a KK series instrument every year since 2012 or 2013.
mwe3: Are future planned projects you spoke about with Carl Clements, Mike Metheny and Markus Reuter still on the table? These projects sound very promising and what else is coming and planned from you and Greydisc this year? Kevin Kastning: Carl and I have our next record about halfway completed, and it will be out in 2017. Mike Metheny and I are still working on our album project; it's going slowly, but I think it's going to be a very beautiful record and different than anything either of us have done. The new record with Mark Wingfield will be released on Greydisc within the next couple of months. It's going to be quite different than any of our previous records, and we're both excited about it. Marcus and I had agreed that we should record together, but we didn't discuss dates. There is a trio record in the can of Sandor, Carl, and me which should be released in late 2017 or early 2018. There are some other Greydisc collaborative projects with some new people on the schedule as well. And several more solo records in the works, too. 2017 is turning out to be the busiest year thus far, and for that I am grateful.